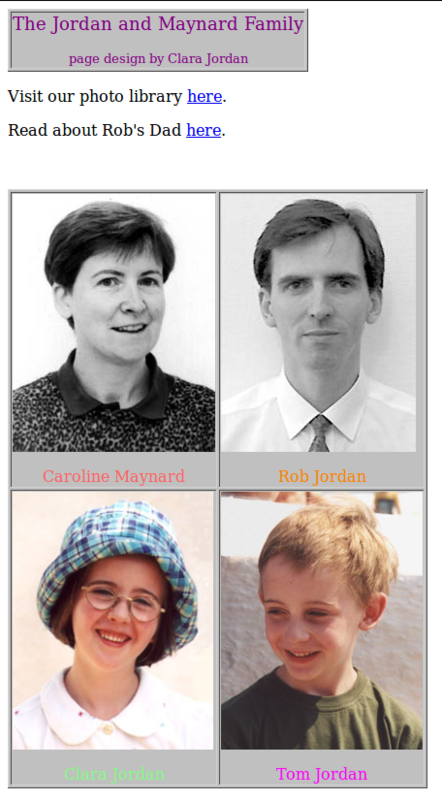 … Jordan-Maynard.org has had a major face-lift. Now using a web log format built upon Movable Type, rather than the oh-so-tired 1999 photo navigator. The intention is to spur more spontaneous updates from the whole family. The old format was horrible to update, though Tom gamely overcame the limitations when his football pages were in full flight. Sadly, this effort has now slipped, along with Southampton’s league position. I have moved across a couple of Clara’s early contributions to give a sense of history (handily using MT’s back-dating facility), but I’m hoping she will soon add some of her more recent stories and poems. A few credits to those who catalysed this metamorphosis: Heather, whose various sites amused and amazed me, while revealing the meaning of “web log”; Simon and Dervala, whose fine writing absorbed more time pre-Christmas than I could possibly afford; Neil, who generously provided templates that I merely recoloured and fussed over for a few days; Dunstan, whose nifty link presentation I filched. Not so much standing on the shoulders of giants, but trailing in their wake. Thanks!